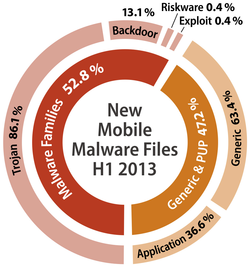 To date, Android is the absolute leader among mobile platforms on the number of targeted malware on it. This is not only the prevalence of gadgets running on the Linux operating system, but also the availability of emerging lately special tools (malware kit), with which the creation of malware under the force of even the most experienced users. Moreover, the virus writers are more often disguise malicious code in applications, which makes the analysis of such software. As a result, an infected attachment remains active for a long time on the device and can be used by hackers in their own selfish purposes. The majority (46%) of new mobile malware for Android Trojans are aimed among other things at stealing banking information or sending paid SMS messages to premium numbers. One of the outstanding examples of this type of malware has become the Trojan FakeSite.A, also known as Perkele [ii]. It is characterized by the fact that virus writers can use it with any other malicious code that acts like a normal bank Trojan. Thus, cybercriminals are using cross-platform malware, for example, to intercept SMS messages containing the authorization codes that banks send their customers to online services. “Today, to be a virus writer, unfortunately, do not need to have special technical skills. Availability of special tools on the Internet only contributes to the spread of dangerous technologies that help cyber criminals to make illegal means, as exemplified by the Trojan Perkele. Analyzing the current trend, it is safe to say that the situation will continue to evolve, and in the second half of the year the number of new Android malware can increase three “- said an antivirus expert of G Data.